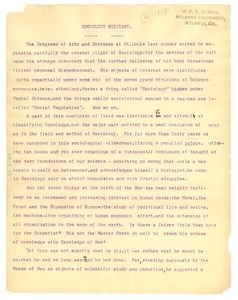 3 results found for: subject:"Sociology"
Sociology - A typed draft of an article exploring the history of sociology as a field of study. A discussion of the definitions of race and nationality. Published in the Midwest Journal, vol. 2, winter 1949. 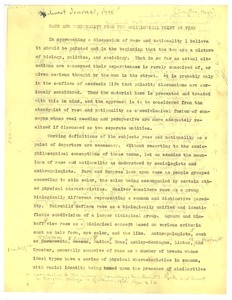 Also delivered as a speech at the graduate school Sociology club at New York University in March 1948. 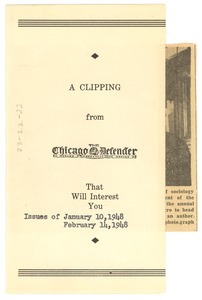 New York (N.Y.) - Enclosing, for his interest, a February 14 clipping on E. Franklin Frazier's noteworthy appointment to the presidency of the American Sociological Society.